Archos announce the Chefpad: Aimed at all those foodies out there! Archos already have a pretty expansive range of Android tablets on the market. There's everything from the small 7 inchers right the way through to an 11.6" beast. They're all solid tablets and they all tend to run Android 4.1 Jelly Bean on similar internal hardware and that's not a bad thing. That trend has been continued today with the announcement of a tablet which is tailored to a very specific group of people and those people are chefs! The main changes to the device specifically for that market are the inclusion of a silicon case and a stand, which although it doesn't sound like anything major it's just a simple way of targeting certain people and it allows the casing to be removed and wiped down if there are any unwanted spillages. The tablet itself is much like Archos' other offerings there's a 9.7" screen front and centre which offered up 1024 x 768 pixels. Android 4.1 Jelly Bean is being driven along by a dual-core Cortex A9 processor which is clocked at 1.6Ghz and there's quad-core Mali 400 graphics here too. On the storage front we've got 1GB of RAM and 8GB of internal storage which is expandable with MicroSD cards up to 64GB in size. Other than that there's 2MP cameras on both the front and back and there's USB On The Go support as well as HDMI output through a Mini HDMI port! As you would expect there's the usual array of sensors and connections and the staples Bluetooth and WiFi are both there, a full list of them is available here. We assume the main thing with this sort of device will be the battery life because there will be a lot of screen on time while people are cooking, but unfortunately we can't seem to find the size or the estimated length of time the battery is meant to last for, but if we do find it we'll be sure to let you know! If you're interested then the device is set to go on sale in June for 169.99€, £149.99 or $209.99 depending on where you live! For full details and more pictures check out Archos' product page here! 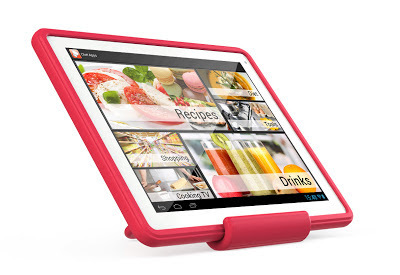 One thing to end on is that even if you're not a chef this is a really good little tablet with a case and stand for £150!